If you were thinking of opening up a store dedicated to VR, then this was probably a good week to do it. After the arrival of the Oculus Rift last week, it was the turn for the HTC Vive to start landing on prospective owner's doorsteps. Buying an Oculus or Vive VR headset is an expensive business right now. So if you're near London and you fancy seeing what all the fuss is about virtual reality, then maybe you should plan a visit to the Virtually Reality store. Tucked away inside Old Street underground station, the pop-up is hard to miss. Just peer into into the window and you can spy someone wearing a Gear VR, or waving Vive controllers in the air or even running on a circular treadmill-looking WizDish ROVR with an Oculus Rift strapped to their heads. Everything is free to try and there are people on hand who really know about VR to talk to you about it. There's accessories on show here too. The Subpac tactile bass system, which we covered in our round up of Oculus Rift accessories sits up on a stand although I'm not sure many people really know what it does. You can even take a seat on a VRGO chair. For someone that has never experienced VR, there's quite a lot crammed into a small space. The company responsible for bring it all together is Virtually Reality, who aim to "provide consumers with a physical place to experience and learn about VR," according to their website. I grab a quick chat with one of the members of the team and they tell me that they've had more than 1,500 people pass through the store since it opened for its week long residence. What has surprised them the most is the age range of people taking an interest. Apparently the 30-35 punter has shown the most enthusiasm for what virtual reality has to offer. As well as trying out everything for free, you do have the option to buy too. That includes a Bosch limited edition Cardboard headset, a Gear VR-looking setup or even one of the accessories that can cost up to $500. The most popular purchase has been the $50 headset as I'm told people are taken back by how much it can cost to set up a Vive or an Oculus Rift once you factor in having the right specced PC. Not really surprising. Before I leave, I'm offered the opportunity to jump on the WizDish ROVR and try on the Rift. I declined. As one of the fortunate people in the store to have already tried all of the kit on show I was willing for someone else to have a try. Just watching those first VR experience reactions will never get old that's for sure. 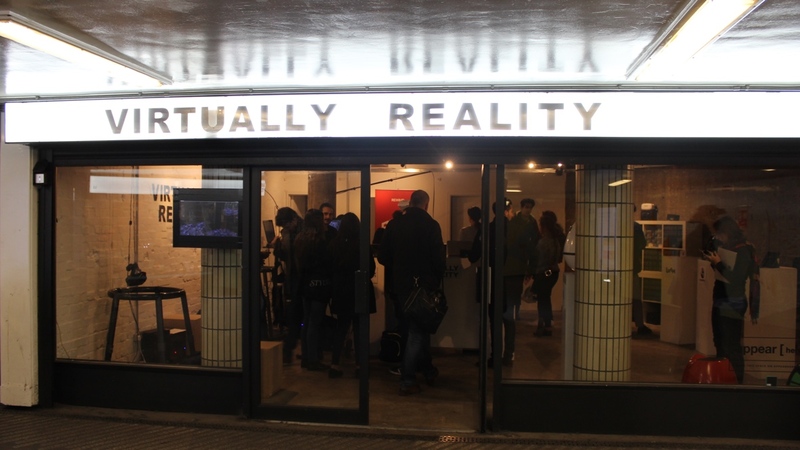 If you want to see what's on show, the Virtually Reality pop-up is situated at Old Street Underground station, London and is open from 8am to 9pm. The shop closes this weekend (10 April 2016) with the Virtually Reality team hoping to have a more permanent residence in the future. Hopefully it's not too long a wait.